Omaha is full of fun Christmas Holiday Events this year. How do you pick which one to go to? Here are all the 2018 Christmas Holiday Events in Omaha, be sure to save the dates. What: Outdoor skating in downtown Omaha. When: Nov. 21, 6 to 8:30 p.m.
Where: Shadow Lake Towne Center, 72nd Street and Highway 370, Papillion, Neb. What: Enjoy discounts at some of the stores and restaurants, plus see the trees light up for the season at dusk. What: This free concert is part of the Holiday Lights Festival kick-off. What: Meet Santa, see the Festival of Trees and countdown the tree lighting at Durham Museum. When: Nov. 23, 6 to 8 p.m.
What: Horse and carriage rides, face painting, food and drink, heated tent, and music by Salem Baptist Church Choir, as well as a visit from Santa and Mrs. Claus. When: Nov. 23, 6 to 10 p.m.
Where: Village Pointe Shopping Center, 17305 Davenport St.
What: Holiday concert begins at 6 p.m. Santa will arrive by carriage and parade starting at 7 p.m. Free carriage rides follow the ceremony and Santa visits take place at the cinema lobby. When: Nov. 23 through Jan. 6, 2019 (closed Thanksgiving, Christmas Day and New Year’s Day); the Holiday Poinsettia Aglow even is 5 to 8 p.m. in the evenings. 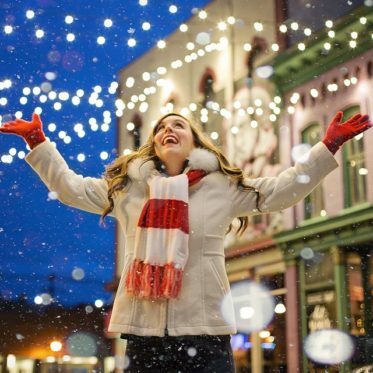 What: The downtown is lit with lights, while families can enjoy free activities like carriage rides, hot chocolate and s’mores, visits with Santa, photos with live reindeer and many more activities. There’s also a Christkindl market. Where: Tree Lighting and Soup Supper at City Hall and Community Center, 8116 Park View Blvd. and Santa’s Workshop at 8305 Park View Blvd. What: An annual event in La Vista. Santa arrives at 6 p.m. to help turn on the lights. When: Nov. 28 and Dec. 12, 3 to 4 p.m.
What: A lesson in science, technology, engineering, art, and mathematics while making gifts. For ages 8-12. What: Violinist Lindsey Stirling brings her popular holiday tour back to Omaha. When: Nov. 29, 5 to 9 p.m.
What: Shop the holiday boutique. Proceeds benefit Youth Emergency Services. When: Nov. 29, 7:30 p.m.
What: From 1997 to 2002, 98 Degrees sold a staggering 10 million records. The band is back together and touring the holiday season. Where: The Apollon, 1801 Vinton St.
What: An interactive dinner show featuring Harry Potter characters. When: Nov. 30 through Dec. 9; Fridays from 5 to 9 p.m., Saturdays from 10 a.m. to 6 p.m., and Sundays from 10 a.m. to 5 p.m.
What: Movies screened include “Elf,” “Home Alone” and “It’s a Wonderful Life” (Nov. 30 through Dec. 6); and “Christmas Vacation,” “The Polar Express” and “Miracle on 34th Street” (Dec. 7-13). What: “Elf: The Musical” is Broadway musical-style show based on the hit movie, “Elf.” It features Buddy the Elf who learns from Santa that he’s a human. The enormous former elf embarks on a quest to the sparkling city of New York during the holidays to find his father. What: A holiday concert featuring music by the Omaha Symphony and aerial performances. What: Saddlebrook Branch and Saddlebrook Community Center co-host Morning with Santa! Come to the gym at 10:30 a.m. for a storytime with Miss Katy from the Omaha Public Library and guest reader Santa. After storytime, families will have an opportunity to meet and take pictures with Santa, bounce and play in the gym, make reindeer food, do a search & find in the library, and enjoy donut holes and juice in the library’s program room. When: Dec. 1, 10 a.m. to 2 p.m.
What: Ride with Santa on a special sleigh around the park, enjoy hot cocoa, write a letter to Santa, explore the trails and more activities. Bring a new pair of mittens or a non-perishable food item to donate. What: Reed, the library elf, is hiding in the Children’s Area! Find him and get a prize. When: Dec. 1 and 2; Saturday from noon to 8 p.m. and Sunday from noon to 5 p.m.
Where: Strategic Air Command and Aerospace Museum, 28210 West Park Highway, Ashland, Neb. What: It’s Santa Claus and Star Wars, with kids activities and free planetarium shows. Where: Fontenelle Forest, 111 N. Bellevue Blvd., Bellevue, Neb. Where: Omaha Public Library Willa Cather Branch, 1905 S. 44th St.
What: Concert performed by Cecilia Jensen. Light refreshments provided. When: Dec. 1, 1 to 5 p.m.
Where: The Crescent Moon Alehouse, 3578 Farnam St.
What: Sample close to 100 holiday beers. Wear your best Ugly Holiday Sweater and enter the fourth annual Holiday Beerfest Ugly Sweater Contest. Cost: $30 in advance, $35 day of (if available). Must be 21+. When: Dec. 1 and Dec. 2, 10 a.m. to 5 p.m.
Where: Aksarben Village, 1920 S. 67th St.
What: Shop theGerman-style open-air market housed under heated tents with more than 55 local vendors. Santa is there Sunday from 2 to 4 p.m.
Where: Film Streams at Dundee Theater, 4952 Dodge St.
What: Classic holiday family-friendly movies shown on the big screen. When: Dec. 2, 2 p.m.
What: Catch Dailey and Vincent from their their nationally broadcast television series bring their Christmas music to you. After a decade preforming fantastically instinctive vocal blends of Dailey’s tenor and Vincent’s reedy harmonies, they have gained well-deserved praise for their own distinctive style. What: Enjoy the lights, sound and bustle of Omaha’s Lights Festival, on either a 5K or a 10K walk. Bring hats, scarves, gloves, mittens and packaged toilet paper to go to a local homeless shelter. Enjoy cookies and hot chocolate after your walk, while picking out your door prize. This is a self-paced walk. When: Dec. 2, 4 and 7:30 p.m.
What: An upbeat celebration featuring musical performances, theater and dance. When: Dec. 4, 5:30 to 6:45 p.m.
What: Kids can use STEAM skills to create light-up cards with copper tape and LED lights. Where: The Waiting Room Lounge, 6212 Maple St.
What: Get your teams together of 2-6 people for a night of trivia for fans of “The Nightmare Before Christmas.” All ages are welcome to attend and compete. Prizes will be awarded. When: Dec. 4-7, 6 p.m. warming time and dinner/show begins at 7 p.m.
What: Celebrate Christmas Renaissance-style with a yearly interactive dinner theatre. When: Dec. 5, 11 a.m.
What: Kids will make holiday cards for a local senior center. When: Thursdays, Dec. 6-20, 10:30 to 11:30 a.m.
What: Santa will read a holiday story to kids. Treats and/or giveaways will be provided for children attending. When: Dec. 6, 11:30 a.m. to 1 p.m. When: Dec. 7, 5 to 8 p.m.
What: Enjoy winter-themed activities like Hot & Cold Science Show and Snowman Bingo, plus meet Santa and friends inside the special exhibit, Santa’s Magic. What: Event includes a lively telling of “A Visit from St. Nicholas,” enhanced with visuals, and songs in the Library Meeting Room. Greet Santa and pose for photos in the gym. Library open house with holiday music and refreshments. When: Dec. 8, 5 to 9 p.m.
Where: Joslyn Castle, 3902 Davenport St.
What: The castle will be decorated in full holiday splendor, guests will be serenaded by Christmas carolers and nosh on holiday themed treats. Enjoy dinner in the famous music room then take a walking tour to learn about the architectural elements and hear stories about Omaha’s first millionaires. When: Dec. 8 and 9; hours are Saturday from 10 a.m. to 5 p.m. and Sunday from noon to 5 p.m.
What: Every hall and floor is decked with art to purchase from local artists. Every floor filled with gifts, treats and entertainment. When: Dec. 8 and 9, noon to 4 p.m.
What: Fill yourself with holiday cheer! Stroll the beautiful poinsettia show, listen to live holiday music, and enjoy holiday food in front of the crackling fireplace in the café. Santa Claus will take photos, and children can make creative holiday crafts ($3 per child). Cost: A $3 program fee for all participating children is charged, along with admission, which is $10 adults, $5 children (6-12). Members are admitted FREE. When: Dec. 8 and 9; performances are Saturday at 2 and 7:30 p.m., and Sunday at 2 p.m.
What: The enchanting ballet set to one of Pyotr Tchaikovsky’s most famous scores. When: Dec. 8 and 9; performances are Saturday at 7:05 p.m. and Sunday at 4:05 p.m.
What: River City Mixed Chorus, Nebraska’s LGBTA chorus, put their whimsical spin on some of the biggest holiday classics, along with special numbers made famous from divas like Bette, Babs, Dolly and more. When: Dec. 8-16; performances are Thursdays and Fridays at 7:30 p.m., Saturdays at 2 and 7:30 p.m., and Sundays at 2 and 6 p.m.
What: An annual tradition on stage featuring the orchestra, dancing Santas, singers and more. When: Dec. 9, 8 a.m. When: Dec. 9, 1:30 to 2:30 p.m.
What: Holiday crafts and a story time with Santa. When: Dec. 9, 4 p.m.
Where: 421 S. 36th St.
What: Ring in the holiday season with the Omaha MasterSingers and Diminuendo. This all acapella concert is sure to put you in the holiday mood as they return to the golden age of holidays tunes. When: Dec. 10, 12:30 to 1:15 p.m. When: Dec. 10, 7:30 p.m.
What: For more than two decades, jazz saxophonist Dave Koz’s holiday tour has been making spirits bright across the nation featuring an impressive roster of guest vocalists and musicians. When: Dec. 11-15; Tuesday through Friday from 4 to 5:30 p.m. and Saturday from 11 a.m. to 1 p.m.
What: Drop in to make holiday crafts that you can take home for gifts or decorations, while supplies last. When: Dec. 11, 4:30 to 6:30 p.m.
What: Drop in and make a holiday card or gift bag using scrapbooking supplies and washi tape. All supplies provided. When: Dec. 11, 7 p.m.
What: Screening with an introduction by Kacie Baum, UNMC Events and Science Outreach Coordinator, who will examine the burning question beneath those yuletide antics: Is Kevin McCallister a psychopath? When: Dec. 12, 10 a.m.
What: Join us for stories, creative movement, music and more. Interaction and participation are welcome. Join your child in making an easy craft for the holiday. When: Dec. 12, 10:30 a.m.
What: Music & Movement focuses on literacy through song, dance, and play designed for active toddlers and their participating caregiver(s). This session includes ringing bells.